The Spanish American wars of independence were the numerous wars against Spanish rule in Spanish America with the aim of political independence that took place during the early 19th century, after the French invasion of Spain during Europe’s Napoleonic Wars. Although there has been research on the idea of a separate Spanish American (“creole”) identity separate from that of Iberia, political independence was not initially the aim of most Spanish Americans, nor was it necessarily inevitable. After the restoration of rule by Ferdinand VII in 1814, and his rejection of the Spanish liberal constitution of 1812, the monarchy as well as liberals hardened their stance toward its overseas possessions, and they in turn increasingly sought political independence. The violent conflicts started in 1809 with short-lived governing juntas established in Chuquisaca and Quito in opposing the government of the Supreme Central Junta of Seville. In 1810, numerous new juntas appeared across the Spanish domains in the Americas when the Central Junta fell to the French invasion. Although various regions of Spanish America objected to many crown policies, “there was little interest in outright independence; indeed there was widespread support for the Spanish Central Junta formed to lead the resistance against the French.” While some Spanish Americans believed that independence was necessary, most who initially supported the creation of the new governments saw them as a means to preserve the region’s autonomy from the French. Over the course of the next decade, the political instability in Spain and the absolutist restoration under Ferdinand VII convinced many Spanish Americans of the need to formally establish independence from the mother country. The events in Spanish America were related to the wars of independence in the former French colony of St-Domingue, Haiti, and the transition to independence in Brazil. Brazil’s independence, in particular, shared a common starting point with that of Spanish America, since both conflicts were triggered by Napoleon’s invasion of the Iberian Peninsula, which forced the Portuguese royal family to flee to Brazil in 1807. The process of Latin American independence took place in the general political and intellectual climate that emerged from the Age of Enlightenment and that influenced all of the Atlantic Revolutions, including the earlier revolutions in the United States and France. A more direct cause of the Spanish American wars of independence were the unique developments occurring within the Kingdom of Spain and its monarchy during this era. Political independence was not necessarily the foreordained outcome of the political turmoil in Spanish America. “There was little interest in outright independence.” As historians R.A. Humphreys and John Lynch note, “it is all too easy to equate the forces of discontent or even the forces of change with the forces of revolution.” Since “by definition, there was no history of independence until it happened,” when Spanish American independence did occur, explanations for why it came about have been sought. There are a number of factors that have been identified. First, increasing control by the Crown of its overseas empire via the Bourbon Reforms of the mid-eighteenth century introduced changes to the relationship of Spanish Americans to the Crown. The language used to describe the overseas empire shifted from “kingdoms” with independent standing with the crown to “colonies” subordinate to Spain. In an effort to better control the administration and economy of the overseas possessions the Crown reintroduced the practice of appointing outsiders, almost all peninsulars, to the royal offices throughout the empire. This meant that Spanish American elites were thwarted in their expectations and ambitions by the crown’s upending of long-standing practices of creole access to office holding. The reforms had mixed results. In some areas—such as Cuba, Río de la Plata and New Spain—the reforms had positive effects, improving the local economy and the efficiency of the government. In other areas, the changes in the crown’s economic and administrative policies led to tensions with locals, which at times erupted into open revolts, such as the Revolt of the Comuneros in New Granada and the Rebellion of Túpac Amaru II in Peru. 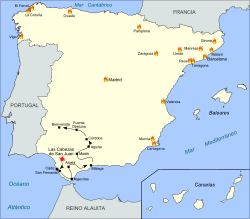 The Peninsular War was the trigger for conflicts in Spanish America in the absence of a legitimate monarch. The Peninsular War began an extended period of instability in the worldwide Spanish monarchy that lasted until 1823. Napoleon’s capture of the Bourbon monarchs precipitated a political crisis in Spain and Spanish America. Although the Spanish world almost uniformly rejected Napoleon’s plan to place his brother, Joseph, on the throne, there was no clear solution to the lack of a king. Following traditional Spanish political theories on the contractual nature of the monarchy (see Philosophy of Law of Francisco Suárez), the peninsular provinces responded to the crisis by establishing juntas. The move, however, led to more confusion, since there was no central authority and most juntas did not recognize the claim of some juntas to represent the monarchy as a whole. The Junta of Seville, in particular, claimed authority over the overseas empire, because of the province’s historic role as the exclusive entrepôt of the empire. This impasse was resolved through negotiations between the several juntas in Spain counted with the participation of the Council of Castile, which led to the creation of a main government: the “Supreme Central and Governmental Junta of Spain and the Indies” on September 25, 1808. It was agreed that the kingdoms of the peninsula would send two representatives to this Supreme Central Junta, and that the overseas kingdoms would send one representative each. These kingdoms were defined as “the viceroyalties of New Spain (Mexico), Peru, New Granada, and Buenos Aires, and the independent captaincies general of the island of Cuba, Puerto Rico, Guatemala, Chile, Province of Venezuela, and the Philippines.” This plan was criticized for providing unequal representation to Spanish America; nevertheless, throughout the end of 1808 and early 1809, the regional capitals elected candidates, whose names were forwarded to the capitals of the viceroyalties or captaincies general. Several important and large cities were left without direct representation in the Supreme Junta. In particular Quito and Chuquisaca, which saw themselves as the capitals of kingdoms, resented being subsumed in the larger Viceroyalty of Peru. This unrest led to the establishment of juntas in these cities in 1809, which were eventually quashed by the authorities within the year. An unsuccessful attempt at establishing a junta in New Spain was also stopped. The Supreme Junta replaced itself with a smaller, five-man council, called the Regency, or the Council of Regency of Spain and the Indies. Next, in order to establish a more legitimate government system, the Regency called for the convening of an “extraordinary and general Cortes of the Spanish Nation”: the “Cádiz Cortes“. The plan for the election of the Cortes, based on provinces, and not kingdoms, was more equitable and provided more time to determine what would be considered an overseas province. The Cádiz Cortes was the first national assembly to claim sovereignty in Spain. It represented the abolition of the old kingdoms. The opening session was held on 24 September 1810, in the building now known as the Real Teatro de las Cortes under the siege of French army. It met as one body and its members represented the entire Spanish empire. Most Spanish Americans saw no reason to recognize a rump government that was under the threat of being captured by the French at any moment, and began to work for the creation of local juntas to preserve the region’s independence from the French. Junta movements were successful in New Granada (Colombia), Venezuela, Chile and Río de la Plata (Argentina). Less successful, though serious movements, also occurred in Central America. Ultimately, Central America, along with most of New Spain, Quito (Ecuador), Peru, Upper Peru (Bolivia), the Caribbean and the Philippine Islands remained in control of royalists for the next decade and participated in the Spanish Cortes effort to establish a liberal government for the Spanish Monarchy. The creation of juntas in Spanish America, such as the Junta Suprema de Caracas on April 19, 1810, set the stage for the fighting that would afflict the region for the next decade and a half. Political fault lines appeared, and were often the causes of military conflict. On the one hand the juntas challenged the authority of all royal officials, whether they recognized the Regency or not. On the other hand, royal officials and Spanish Americans who desired to keep the empire together were split between liberals, who supported the efforts of the Cortes, and conservatives (often called “absolutists” in the historiography), who did not want to see any innovations in government. Finally, although the juntas claimed to carry out their actions in the name of the deposed king, Ferdinand VII, their creation provided an opportunity for people who favored outright independence to promote their agenda publicly and safely. The proponents of independence called themselves patriots, a term which eventually was generally applied to them. The idea that independence was not the initial concern is evidenced by the fact that few areas declared independence in the years after 1810. The congresses of Venezuela and New Granada did so in 1811 and also Paraguay in same year (14 and 15 of May 1811). Some historians explain the reluctance to declare independence as a “mask of Ferdinand VII”: that is, that patriot leaders felt that they needed to claim loyalty to the deposed monarch in order to prepare the masses for the radical change that full independence eventually would entail. Nevertheless, even areas such as Río de la Plata and Chile, which more or less maintained de facto independence from the peninsular authorities, did not declare independence until quite a few years later, in 1816 and 1818, respectively. Overall, despite achieving formal or de facto independence, many regions of Spanish America were marked by nearly continuous civil wars, which lasted well into the 1820s. In Mexico, where the junta movement had been stopped in its early stages by a coalition of Peninsular merchants and government officials, efforts to establish a government independent of the Regency or the French took the form of rebellion, under the leadership of Miguel Hidalgo. Hidalgo was captured and executed in 1811, but a resistance movement continued, which declared independence from Spain in 1813. In Central America, attempts at establishing juntas were also put down, but resulted in significantly less violence. The Caribbean islands, like the Philippines on the other side of the world, were relatively peaceful. Any plots to set up juntas were denounced to the authorities early enough to stop them before they gained widespread support. Major cities and regional rivalry played an important role in the wars. The disappearance of a central, imperial authority—and in some cases of even a local, viceregal authority (as in the cases of New Granada and Río de la Plata)—initiated a prolonged period of balkanization in many regions of Spanish America. It was not clear which political units should replace the empire, and there were no new national identities to replace the traditional sense of being Spaniards. The original juntas of 1810 appealed first to a sense of being Spanish, which was counterposed to the French threat; second, to a general American identity, which was counterposed to the Peninsula lost to the French; and third, to a sense of belonging to the major cities or local province, the patria in Spanish. More often than not, juntas sought to maintain a province’s independence from the capital of the former viceroyalty or captaincy general as much as from the Peninsula itself. Armed conflicts broke out between the provinces over the question of whether some cities or provinces were to be subordinate to others as they had been under the crown. This phenomenon was particularly evident in South America. This rivalry also led some regions to adopt the opposite political cause to that chosen by their rivals. Peru seems to have remained strongly royalist in large part because of its rivalry with Río de la Plata, to which it had lost control of Upper Peru when the latter was elevated to a viceroyalty in 1776. The creation of juntas in Río de la Plata allowed Peru to regain formal control of Upper Peru for the duration of the wars. Underlying social and racial tensions also had a great impact on the nature of the fighting. Rural areas were pitted against urban centers, as grievances against the authorities found an outlet in the political conflict. This was the case with Hidalgo’s peasant revolt, which was fueled as much by discontent over several years of bad harvests as with events in the Peninsular War. Hidalgo was originally part of a circle of liberal urbanites in Querétaro, who sought to establish a junta. After this conspiracy was discovered, Hidalgo turned to the rural people of the Mexican Bajío to build his army, and their interests soon overshadowed those of the urban intellectuals. A similar tension existed in Venezuela, where the Spanish immigrant José Tomás Boves formed a powerful, though irregular, royalist army out of the Llaneros, mixed-race slave and plains people, by attacking the white landowning class. Boves and his followers often disregarded the command of Spanish officials and were not concerned with actually re-establishing the toppled royal government, choosing instead to keep real power among themselves. Finally, in the back country of Upper Peru, the republiquetas kept the idea of independence alive by allying with disenfranchised members of rural society and native groups, but were never able to take the major population centers. Increasingly violent confrontations developed between Spaniards and Spanish Americans, but this tension was often related to class issues or fomented by patriot leaders to create a new sense of nationalism. After being incited to rid the country of the gachupines (a disparaging term for Peninsulares), Hidalgo’s forces indiscriminately massacred hundreds of Criollos and Peninsulares who had taken refuge at the Alhóndiga de Granaditas in Guanajuato. In Venezuela during his Admirable Campaign, Simón Bolívar instituted a policy of a war to the death, in which royalist Spanish Americans would be purposely spared but even neutral Peninsulares would be killed, in order to drive a wedge between the two groups. This policy laid the ground for the violent royalist reaction under Boves. Often though, royalism or patriotism simply provided a banner to organize the aggrieved, and the political causes could be discarded just as quickly as they were picked up. The Venezuelan Llaneros switched to the patriot banner once the elites and the urban centers became securely royalist after 1815, and it was the royal army in Mexico that ultimately brought about that nation’s independence. Ferdinand’s actions constituted a definitive de facto break both with the autonomous governments, which had not yet declared formal independence, and with the effort of Spanish liberals to create a representative government that would fully include the overseas possessions. Such a government was seen as an alternative to independence by many in New Spain, Central America, the Caribbean, Quito, Peru, Upper Peru and Chile. Yet the news of the restoration of the “ancien régime” did not initiate a new wave of juntas, as had happened in 1809 and 1810, with the notable exception of the establishment of a junta in Cuzco demanding the implementation of the Spanish Constitution. Instead most Spanish Americans were moderates who decided to wait and see what would come out of the restoration of normalcy. In fact, in areas of New Spain, Central America and Quito, governors found it expedient to leave the elected constitutional ayuntamientos in place for several years in order to prevent conflict with the local society. Liberals on both sides of the Atlantic, nevertheless, continued to conspire to bring back a constitutional monarchy, ultimately succeeding in 1820. The most dramatic example of transatlantic collaboration is perhaps Francisco Javier Mina‘s expedition to Texas and northern Mexico in 1816 and 1817. Towards the end of this period the pro-independence forces made two important advances. In the Southern Cone, a veteran of the Spanish army with experience in the Peninsular War, José de San Martín, became the governor of the Province of Cuyo. He used this position to begin organizing an army as early as 1814 in preparation for an invasion of Chile. This was an important change in strategy after three United Provinces campaigns had been defeated in Upper Peru. San Martín’s army became the nucleus of the Army of the Andes, which received crucial political and material support in 1816 when Juan Martín de Pueyrredón became Supreme Director of the United Provinces. In January 1817, San Martín was finally ready to advance against the royalists in Chile. Ignoring an injunction from the congress of the Río de la Plata not to move against Chile, San Martín together with General Bernardo O’Higgins Riquelme, later Supreme Director of Chile, led the Army over the Andes in a move that turned the tables on the royalists. By February 10, San Martín had control of northern and central Chile, and a year later, after a war with no quarter, the south. With the aid of a fleet under the command of former British naval officer Thomas Cochrane, Chile was secured from royalist control and independence was declared that year. San Martín and his allies spent the next two years planning an invasion of Peru, which began in 1820. In northern South America, after several failed campaigns to take Caracas and other urban centers of Venezuela, Simón Bolívar devised a similar plan in 1819 to cross the Andes and liberate New Granada from the royalists. Like San Martín, Bolívar personally undertook the efforts to create an army to invade a neighboring country, collaborated with pro-independence exiles from that region, and lacked the approval of the Venezuelan congress. Unlike San Martín, however, Bolívar did not have a professionally trained army, but rather a quickly assembled mix of Llanero guerrillas, New Granadan exiles led by Santander and British recruits. From June to July 1819, using the rainy season as cover, Bolívar led his army across the flooded plains and over the cold, forbidding passes of the Andes, with heavy losses—a quarter of the British Legion perished, as well as many of his Llanero soldiers, who were not prepared for the nearly 4,000-meter altitudes—but the gamble paid off. By August Bolívar was in control of Bogotá and its treasury, and gained the support of many in New Granada, which still resented the harsh reconquest carried out under Morillo. Nevertheless, Santander found it necessary to continue the policy of the “war to the death” and carried out the execution of thirty-eight royalist officers who had surrendered. With the resources of New Granada, Bolívar became the undisputed leader of the patriots in Venezuela and orchestrated the union of the two regions in a new state called Colombia (Gran Colombia). Vicente Guerrero and Agustín de Iturbide in the “Abrazo of Acatempan”, when they agreed to combine forces to fight the royalist army. Oil painting by Román Sagredo, collection of the Museo Nacional de Historia, INAH, México). In January 1821, Iturbide began peace negotiations with Guerrero, suggesting they unite to establish an independent New Spain. The simple terms that Iturbide proposed became the basis of the Plan of Iguala: the independence of New Spain (now to be called the Mexican Empire) with Ferdinand VII or another Bourbon as emperor; the retention of the Catholic Church as the official state religion and the protection of its existing privileges; and the equality of all New Spaniards, whether immigrants or native-born. The following month the other important guerrilla leader, Guadalupe Victoria, joined the alliance, and on March 1 Iturbide was proclaimed head of a new Army of the Three Guarantees. The representative of the new Spanish government, Superior Political Chief Juan O’Donojú, who replaced the previous viceroys, arrived in Veracruz on July 1, 1821, but he found that royalists held the entire country except for Veracruz, Mexico City and Acapulco. Since at the time that O’Donojú had left Spain, the Cortes was considering greatly expanding the autonomy of the overseas Spanish possessions, O’Donojú proposed to negotiate a treaty with Iturbide on the terms of the Plan of Iguala. The resulting Treaty of Córdoba, which was signed on August 24, kept all existing laws, including the 1812 Constitution, in force until a new constitution for Mexico could be written. O’Donojú became part of the provisional governing junta until his death on October 8. Both the Spanish Cortes and Ferdinand VII rejected the Treaty of Córdoba, and the final break with the mother country came on May 19, 1822, when the Mexican Congress conferred the throne on Iturbide. Central America gained its independence along with New Spain. On September 15, 1821, an Act of Independence was signed in Guatemala City which declared Central America (Guatemala, Honduras, El Salvador, Nicaragua, and Costa Rica) independent from Spain. The regional elites supported the terms of the Plan of Iguala and orchestrated the union of Central America with the Mexican Empire in 1821. Two years later, following Iturbide’s downfall, the region, with the exception of Chiapas, peacefully seceded from Mexico on July 1, 1823, establishing the Federal Republic of Central America. The new state existed for seventeen years, centrifugal forces pulling the individual provinces apart by 1840. Bolívar, learning about the collapse of the Cádiz expedition, spent the year 1820 preparing a liberating campaign in Venezuela. Bolívar was aided by Spain’s new policy of seeking engagement with the insurgents, which Morillo implemented, renouncing to the command in chief, and returning to Spain. Although Bolívar rejected the Spanish proposal that the patriots rejoin Spain under the Spanish Constitution, the two sides established a six-month truce and the regularization of the rules of engagement under the law of nations on November 25 and 26. The truce did not last six months. It was apparent to all that the royalist cause had been greatly weakened by the lack of reinforcements. Royalist soldiers and whole units began to desert or defect to the patriots in large numbers. On January 28, 1821, the ayuntamiento of Maracaibo declared the province an independent republic that chose to join the new nation-state of Gran Colombia. Miguel de la Torre, who had replaced Morillo as head of the army, took this to be a violation of the truce, and although the republicans argued that Maracaibo had switched sides of its own volition, both sides began to prepare for renewed war. The fate of Venezuela was sealed when Bolívar returned there in April leading an army of 7,000 from New Granada. At the Battle of Carabobo on June 24, the Gran Colombian forces decisively defeated the royalist forces, assuring control of Venezuela save for Puerto Cabello and guaranteeing Venezuelan independence. Bolívar could now concentrate on Gran Colombia’s claims to southern New Granada and Quito. In Peru, on January 29, 1821, Viceroy Pezuela was deposed in a coup d’état by José de la Serna, but it would be two months before San Martín moved his army closer to Lima by sailing it to Ancón. During the next few months San Martín once again engaged in negotiations, offering the creation of an independent monarchy; but La Serna insisted on the unity of the Spanish monarchy, so the negotiations came to nothing. By July La Serna judged his hold on Lima to be weak, and on July 8 the royal army abandoned the coastal city in order to reinforce positions in the highlands, with Cuzco as new capital of the viceroyalty. On the 12th San Martín entered Lima, where he was declared “Protector of the Country” on July 28, an office which allowed him to rule the newly independent state. To ensure that the Presidency of Quito became a part of Gran Colombia and did not remain a collection of small, divided republics, Bolívar sent aid in the form of supplies and an army under Antonio José de Sucre to Guayaquil in February 1821. For a year Sucre was unable to take Quito, and by November both sides, exhausted, signed a ninety-day armistice. The following year, at the Battle of Pichincha on May 24, 1822, Sucre’s Venezuelan forces finally conquered Quito; Gran Colombia’s hold on the territory was secure. The following year, after a Peruvian patriot army was destroyed in the , San Martín met with Simón Bolívar in Guayaquil on July 26 and 27. Thereafter San Martín decided to retire from the scene. For the next two years, two armies of Rioplatense (Argentinian), Chilean, Colombian and Peruvian patriots were destroyed trying to penetrate the royalist bastion in the Andean regions of Peru and Upper Peru. A year later a Peruvian congress resolved to make Bolívar head of the patriot forces in the country. An internecine conflict between La Serna and General Pedro Antonio Olañeta, which was an extension of the Liberal Triennium, proved to be the royalists’ undoing. La Serna lost control of half of his best army by the beginning of 1824, giving the patriots an opportunity. 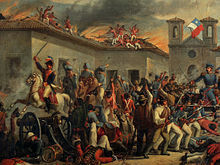 Under the command of Bolívar and Sucre, the experienced veterans of the combined army, mainly Colombians, destroyed a royalist army under La Serna’s command in the Battle of Ayacucho on December 9, 1824. La Serna’s army was numerically superior but consisted of mostly new recruits. The only significant royalist area remaining on the continent was the highland country of Upper Peru. Following the Battle of Ayacucho, the royalist troops of Upper Peru under the command of Olañeta surrendered after he died in Tumusla on April 2, 1825. Bolívar tended to favor maintaining the unity of Upper Peru with Peru, but the Upper Peruvian leaders—many former royalists, like Casimiro Olañeta, nephew of General Olañeta—gathered in a congress under Sucre’s auspices supported the country’s independence. Bolívar left the decision to Sucre, who went along with the congress. Sucre proclaimed Upper Peru’s independence in the city which now bears his name on August 6, bringing the main wars of independence to an end. The increasing irrelevance of the Holy Alliance after 1825 and the fall of the Bourbon dynasty in France in 1830 during the July Revolution eliminated the principal support of Ferdinand VII in Europe, but it was not until the king’s death in 1833 that Spain finally abandoned all plans of military reconquest, and in 1836 its government went so far as to renounce sovereignty over all of continental America. During the course of the 19th century, Spain would recognize each of the new states. Only Cuba and Puerto Rico remained under Spanish rule, until the Spanish–American War in 1898. The nearly decade and a half of wars greatly weakened the Spanish American economies and political institutions, which hindered the region’s potential economic development for most of the nineteenth century and resulted in the enduring instability the region experienced. Independence destroyed the de facto trade bloc that was the Spanish Empire – Manila galleons and Spanish treasure fleets in particular. After independence, trade among the new Spanish American nations was less than it had been in the colonial period. Once the ties were broken, the small populations of most of the new nations provided little incentive to entice Spanish American producers to recreate the old trade patterns. In addition, the protection against European competition, which the Spanish monopoly had provided to the manufacturing sectors of the economy, ended. Due to expediency, protective tariffs for these sectors, in particular textile production, were permanently dropped and foreign imports beat out local production. This greatly affected Native communities, which in many parts of Spanish America, specialized in supplying finished products to the urban markets, albeit using pre-industrial techniques. The wars also greatly affected the principal economic sector of the region, mining. Silver production in Bolivia halved after independence and it dropped by three quarters in Mexico. Cities dependent on seaborne trade like Valdivia plunged into depression as the intracolonial trade system collapsed. Bolívar himself was a supporter of women’s rights and suffrage in Latin America. It was Bolívar who allowed for Sáenz to become the great pioneer of women’s freedom. He wanted to set the women of Latin America free from the oppression and inferiority of what the Spanish regime had established. 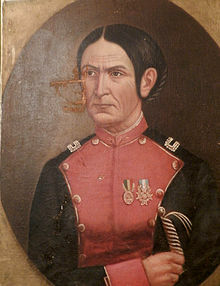 Bolívar even made Sáenz a Colonel of the Colombian Army due to her heroics which caused controversy because there were no women in the army at the time. Another woman who gained prominence in the fight for independence was Juana Azurduy de Padilla, a mixed-race woman who fought for independence in the Río de la Plata region. Argentine President Cristina Fernández de Kirchner posthumously promoted her to the rank of general. According to gender stereotypes, women were not meant to be soldiers; only men were supposed to engage in fighting and conflict. There were still plenty of women present on the battlefields to help rescue and nurse soldiers. Some women fought alongside their husbands and sons on the battlefield. The majority of women assumed supportive and non-competitive roles such as fundraising and caring for the sick. Revolution for women meant something different than for men. Women saw revolution as a way to earn equal rights, such as voting, and to overcome the suppression of subordination of women to men. Women were usually identified as victims during the independence wars since the women of Latin America were forced to sacrifice for the cause. The ideals of womanhood meant that women must sacrifice what the situation required such as a mother sacrificing her son or a virgin knowing she might be sacrificing motherhood or marriage due to the loss of many young men. This view meant that women were meant to contribute to independence in a supportive role while leaving the combat and politics in the hands of the men. Independence also did not result in stable political regimes, save in a few countries. First, the new nations did not have well-defined identities, but rather the process of creating identities was only beginning. This would be carried out through newspapers and the creation of national symbols, including new names for the countries (“Mexico”, “Colombia”, “Ecuador”, “Bolivia”, “Argentina”), that broke with the past. In addition, the borders were not firmly established, and the struggle between federalism and centralism, which began in independence, continued throughout the rest of the century. Two large states that emerged from the wars—Gran Colombia and the Federal Republic of Central America—collapsed after a decade or two, and Argentina would not consolidate politically until the 1860s. ^ Timothy Anna,”Review”, American Historical Review vol. 123 (3) 2018, pp. 985-86. ^ David Bushnell, ” Wars of Independence: South America” in The Encyclopedia of Latin American History and Culture, vol. 5, p. 446. New York: Charles Scribner’s Sons 1996. ^ David Bushnell, “Wars of Independence: South America” in The Encyclopedia of Latin American History and Culture, vol. 5, p. 446. New York: Charles Scribner’s Sons 1996. ^ R.A. Humphreys and John Lynch, “Introduction”, The Origins of the Latin American Revolutions, 1808-1826. New York: Alfred A. Knopf 1965, p. 7. ^ Jeremy Adelman, “Independence in Latin America” in The Oxford Handbook of Latin American History, José C. Moya, ed. New York: Oxford University Press 2011, p. 154. ^ William B. Taylor, “Early Latin American Social History” in Reliving the Past: The Worlds of Social History. Chapel Hill: University of North Carolina Press 1985, p. 149. ^ Margaret Chowning, “The Consolidación de Vales Reales in the Bishopric of Michoacán.” Hispanic American Historical Review 69:3 (1989) 451-78. ^ Michael P. Costeloe, Church Wealth in Mexico: A Study of the “Juzgado de Capellanías” in the Archbishopric of Mexico, 1800–1856. Cambridge University Press 1967. ^ Robertson, William Spence (1916). “The Juntas of 1808 and the Spanish Colonies”. The English Historical Review. 31 (124): 573–585. doi:10.1093/ehr/XXXI.CXXIV.573. JSTOR 551442. ^ “Batalla de Ocaña”. Bicentenario de las independencias iberoaméricanas. Ministerio de Educación, Cultura y Deporte (Spain). Retrieved August 17, 2012. ^ Rebecca Earle, “‘A Grave for Europeans’? Disease, Death, and the Spanish-American Revolutions” in Christon I. Archer, ed. The Wars of Independence in Spanish America, 283–297. ^ Lynch analyzes the events through the older theory of a “conservative revolution”: Spanish American Revolutions, 319–320. Compare to Rodríguez, Independence of Spanish America, 196–197, 199–205, 241–242. Kinsbruner, Independence in Spanish America, 97–98. Peter F. Guardino, “The War of Independence in Guerrero, New Spain, 1808–1821” in Archer, The Wars of Independence in Spanish America, 122–124. ^ Lynch, Spanish American Revolutions, 320–323. Rodríguez, Independence of Spanish America, 206–210. Kinsbruner, Independence in Spanish America, 98–99. Guardino, “The War of Independence in Guerrero,” 121, 124–125. ^ Lynch, Spanish American Revolutions, 185–189, 247–249, 267–272. Rodríguez, Independence of Spanish America, 219–220, 222–231. Timothy E. Anna, “Chaos and the Military Solution: The Fall of Royalist Government in Peru” in Archer, The Wars of Independence in Spanish America, 272–273. Kinsbruner, Independence in Spanish America, 77–78, 90–95. ^ Bushnell, David (1970). The Santander Regime in Gran Colombia. Westport: Greenwood Press. pp. 325–335. ISBN 0-8371-2981-8. Lynch, Spanish American Revolutions, 272–273, 279–284. Rodríguez, Independence of Spanish America, 232–234. Kinsbruner, Independence in Spanish America, 95–96. Chasteen, John Charles (2008). Americanos: Latin America’s Struggle for Independence. Oxford University Press. pp. 164–165. ISBN 978-0-19-517881-4. ^ Rodríguez, Independence of Spanish America, 3–5, 213, 239. Kinsbruner states, “[I]n Mexico between 1820 and 1835 a larger percentage of adult males were permitted to vote than was the case in the United States, Great Britain, or France.” Independence in Spanish America, 90. ^ Blaufarb, Rafe (2016). “Arms for Revolutions: Military Demobilization after the Napoleonic Wars and Latin American Independence”. ^ Waddell, D. A. G. (1987). “British Neutrality and Spanish—American Independence: The Problem of Foreign Enlistment”. Méndez, Cecilia. “Incas si, Indios no: Notes on Peruvian Creole Nationalism and Its Contemporary Crisis.” Journal of Latin American Studies, 28 (1) (Feb. 1996) pp. 197-225. Adelman, Jeremy. “Independence in Latin America” in The Oxford Handbook of Latin American History, José C. Moya, ed. New York: Oxford University Press 2011, pp. 153-180.